Want a consistent and fair hiring process? Competency – They can do the job. They have the skills, experience and ability to actually complete the tasks you’re going to set them. Commitment – They want to do the job. They are motivated to want to do the job now and in the future, for your product and your brand. Culture fit – They are the right culture fit for the team. They will make themselves, the team and the company better. Has hiring for fit ever felt like guesswork? After almost a decade in recruitment, I’d spend weeks finding candidates with amazing technical ability only for them to be turned down by hiring managers due to “culture fit”. Whenever I asked them what they meant by this, more often than not I heard intangibles that often reflected a desire to hire people like themselves rather than embrace difference. Frustratingly, with everyone having a different opinion on what the ‘culture fit’ should be there was very little that I could learn from for the next candidate put forward. Cultural fit is subjective. To some, a ‘good fit’ is someone they can have a beer with. What about people who don’t drink? To some, it’s a series of personality traits that “just work here”, what about diversity? To some it’s if they went to a good school or red-brick University. We all make these shortcuts to help rationalise decisions and whilst likability and familiarity can be important, it’s a combination of compatibility and diversity that drives effective team performance. Based on extensive research into what makes teams work better together we developed ThriveMap, a survey which measures how people like to work. With ThriveMap, managers and recruiters can talk about culture fit in a consistent and objective way, that has everyone talking from the same page. It’s a big number, but it’s obvious to most recruiters. When you hire new people, you are normally pretty sure they have the capacity to do the job. Hiring assessments and previous experience provide pretty solid checks and balances against hiring people that literally cannot do the job. Where current hiring practices are yet to catch up, and the reason 89% of hires fail, are for non-technical reasons e.g. culture fit. That’s where we come in. Each team is has it’s own unique culture. Sometimes it’s easy to articulate, sometimes it’s hard to. But each person will see it differently. To avoid ambiguity and improve accuracy, the best way is to ask everyone on the team. But when you’re hiring for multiple roles that’s just not feasible. You’ll want to ensure there’s a consistent and objective measure of culture fit on each candidate ahead of interview. It’s important so that the recruitment team, the manager, the team themselves knowing that each and every person means the same thing when talking about culture fit. 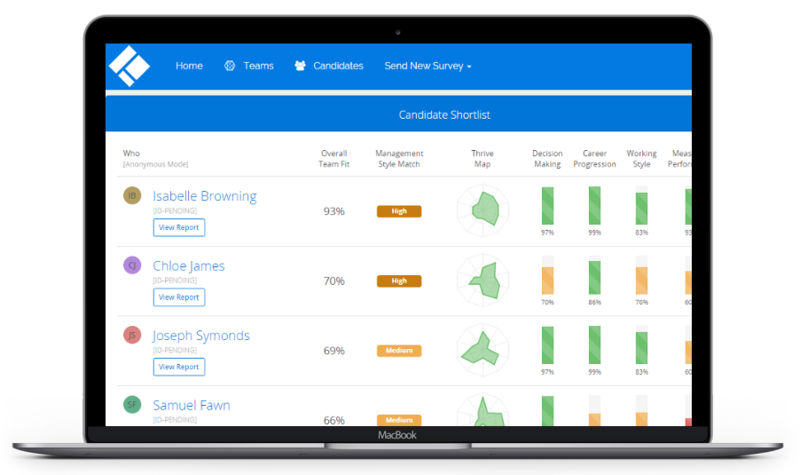 Using ThriveMap to analyse how candidates fit in with the team’s working style allows you to implement a quick, consistent and accurate way of hiring people who will make your teams, company and themselves better. An innovation created from the unique candidate perspective, ThriveMap offers not just a measure of culture fit not found on any competing product, but a truly comprehensible and enjoyable solution to avoid bad hires. 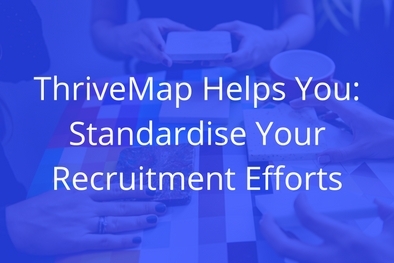 Using ThriveMap, you learn how your team likes to work, you learn how your candidates like to work, and then compare the two for a true culture fit assessment.